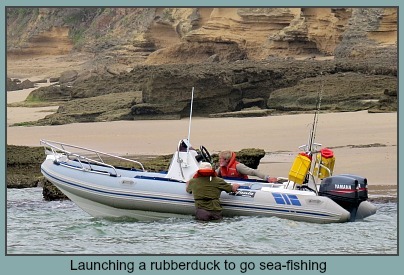 The Garden Route offers many opportunities for recreational fishing. 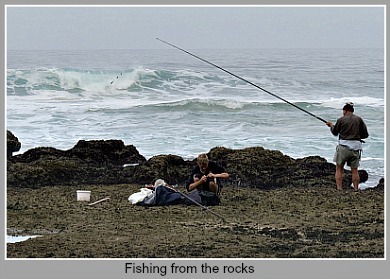 There’s surf and rock fishing to be enjoyed in many pristine and beautiful places along the coastline like Swartvlei and Cola Beaches, Gerickes Point, Buffalo Bay, Goukamma Nature Reserve (no bait collecting though), Knysna Lagoon, Wilderness Beach, Victoria Bay pier, and Kleinkrans. 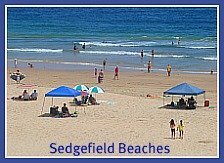 In from the shoreline at Sedgefield, there’s Swartvlei Lake either fishing from the disused railway line or from a boat (launch at Pine Lake Marina). 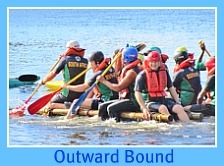 To fish in the estuary (depending on the tide) a boat can be launched from the Island at Fish Eagle Green or from the boat launch on Kingfisher Drive. 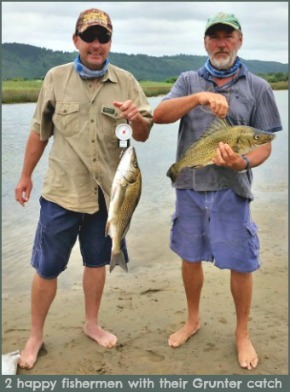 There's also Eilandvlei near Wilderness and then Groenvlei, east of Sedgefield–the latter is the only freshwater lake in the area where reputedly there’s some of the best bass fishing in South Africa to be had. 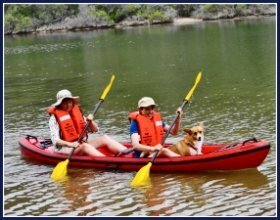 Valid permits for recreational fishing are necessary and can be obtained from SANParks offices in Wilderness at Ebb & Flow Rest Camp, and on Thesens Island in Knysna and also at Cape Nature Offices in Goukamma Nature Reserve outside Buffalo Bay. 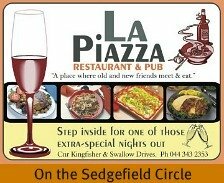 In Sedgefield the Post Office supplies permits. 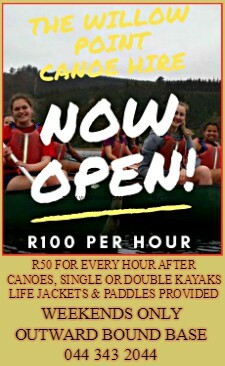 M’s Sports and Hobbies, (Tel: 074 772 1442) 2 Forest Lodge Centre on the north side of the N2 (turn left at the traffic lights). Both these shops can advise visitors on local hot-spots, current conditions and the do’s and don’ts. 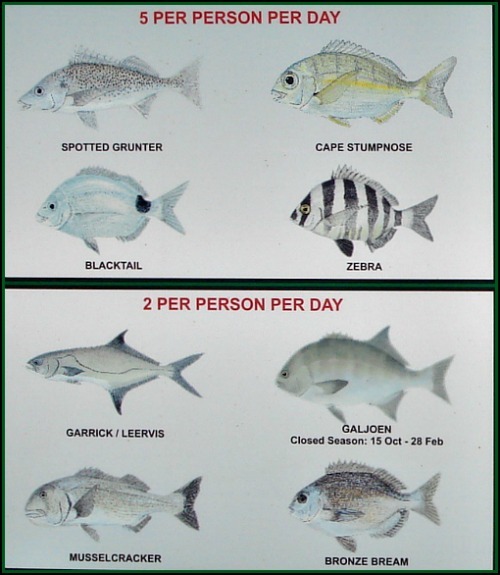 DAFF's Fisheries’ division has published a recreational fishing pamphlet (2014-2015) to guide recreational fishermen regarding the number and species of fish they may catch and where they may catch them. It can be downloaded here. It is estimated that currently annual recreational ﬁshing licences across all the sectors total about 300 000, with income generated from these licences amounting to R18 million. The actual annual catch is about 17 000 tons of high-value species. 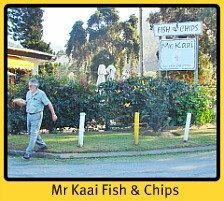 However, in 1989, the Dept of Environmental Affairs issued a booklet for Marine Day titled ”Oceans of Food” in which they state that the informal sector of the angling industry reflected about 288,000 beach and rock anglers, 50,000 in dinghies, 128,000 in deep-sea boats and 4,000 spear-fishermen. 37,492 licences were issued to the public to catch rock lobsters and 20,083 to dive for abalone. This totals over ½ million recreational fishermen. Is there any likelihood that 26 years on, this number has reduced by 200 000? To all intents and purposes, it has increased and the government department’s (DAFF) figures are woefully inaccurate and an indication of how poorly the industry (in this category at any rate) is being monitored. This is in spite of a recent UN report, that more than two thirds of the world's ﬁsheries have been overﬁshed or are fully harvested, and more than one third is in a state of decline, due to the loss of ﬁsh habitats, soaring pollution levels in oceans and rivers and climate change. Besides this, the report advises that abalone stocks remain heavily depleted due to increasing levels of poaching and ecological factors and many line ﬁsh resources are also heavily depleted depending on species. It is worth pointing out that many popular angling fish caught for eating are juveniles that have not yet reached maturity. 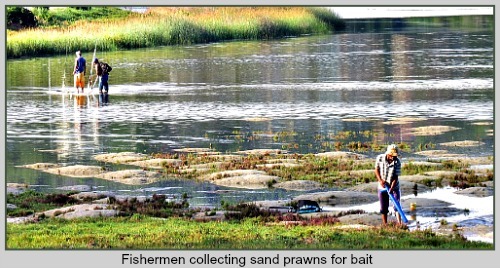 Shallow sandy areas, estuaries and rocky pools are their nurseries where recreational fishermen fish so their conservation ethics can have far reaching effects on many species. 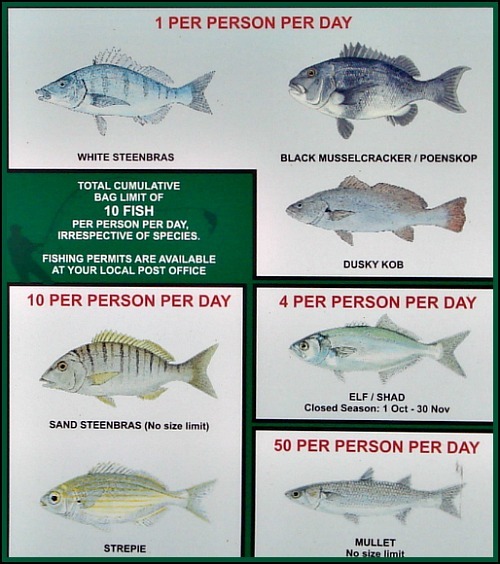 Consequently, DAFF has instituted bag limits on these fish because of the demand made on them by inveterate fishing. This is to enable enough of them to reach maturity to form breeding stock that can propagate their species. Remember, they have to contend with other predators and dangers in their environment besides man. Here is some relevant information regarding the life span of popular angling fish and their habitat. For all recreational fishing enthusiasts I recommend “Two Oceans” a reference book that is a comprehensive photographic guide to the marine life of Southern Africa. It covers categories such as sponges, worms, arthropods (crustaceans, shrimps, crabs), shells and molluscs (snails, octopus, squid), fishes, mammals, seaweeds, birds, plants and more…. 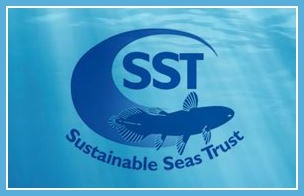 An introduction explains species, where they live, the effect of currents and tides and the importance of conservation. 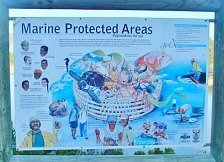 It also provides useful information to those who love, respect and enjoy the bounty and beauty of the marine fauna and flora that flourish along our coastline helping us all to appreciate the value of our rich marine heritage. Here is an example from the book - Common Sandprawns –Pink, fragile and translucent…They are abundant in estuaries even those closed to the sea for years. They build deep burrows, sift sediment for food, ejecting particles from the burrows to create miniature volcanoes. This bioturbation has a profound effect on other organisms by diminishing bacteria, depleting sediment, consolidating bacterial films of mucous, burying diatoms, reducing meiofauna, and inhibiting larval settlement of many species. The result is these seemingly inconsequential ephemeral creatures are termed "ecosystem engineers". 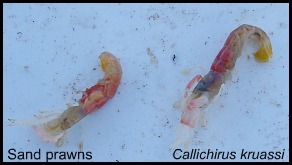 Unfortunately, trampling and pumping prawns for bait collapses their burrows harming the whole ecosystem. In most instances, this is an action of ignorance rather than deliberate intention. 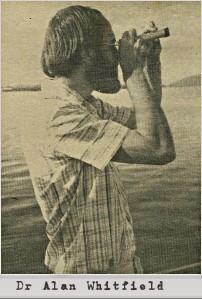 In the 1980's Dr Whitfield from the Institute of Fresh Water Studies (IFWS) at Rhodes University was investigating the relationship between plants and fishes in the whole Swartvlei system. 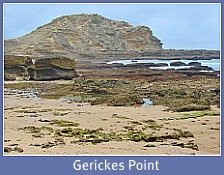 He said that sand prawns are an important food source for species such as carnivorous steenbras and spotted grunter that could be put at risk if their food source was depleted. 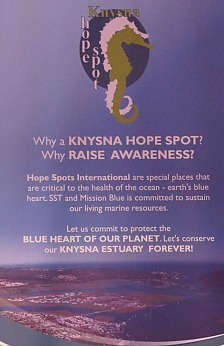 To minimise the effect of human interferance, I believe there ought to be closed areas along the Swartvlei estuary (as there are in other estuaries) where pumping of prawns is prohibited for determined periods so these prawn beds are given opportunity to recover and fulfill their environmental role for the benefit of the lagoon as a whole. Dr Whitfield also unequivocally stated that the artificial opening of the river mouth was highly detrimental to the fish fauna as it could interfere with the natural cycle of migration of juveniles into their nursery areas and premature release into the sea. Limit your catch, don’t catch your limit – leave something for tomorrow and for future generations. Practise “Catch and Release” if you don’t need or want the food. e.g. like sharks and rays. Don’t just kill it because you caught it. Apex predators are vital to the health of the oceans yet 100 million sharks are needlessly killed every year. Don’t target big fish (breeding stock) in their prime for the sake of landing a trophy specimen like a 30-75 kg Dusky Kob just to earn some serious bragging rights. They take 5 years to reach maturity i.e. breeding age and can live to 42 years. Trophy specimens are generally not good for eating and if caught with inadequate tackle (e.g. 4 kg line catching a 20 kg fish) it would probably be half dead when landed with little chance of survival. Behave responsibly and take your plastic bottles, polystyrene food containers, plastic bags and other refuse with you. Leave only footprints. Be an example to others and don’t endanger other shore life (and beach goers) Gather up broken lines, hooks, plastic bait containers, etc. See this link for more best practices regarding recreational fishing. If you're interested in all aspects of South Africa's marine life this is an excellent field guide to help you on your way.